It’s finally here: Facebook’s latest and “greatest” News Feed design began rolling out to users this week. 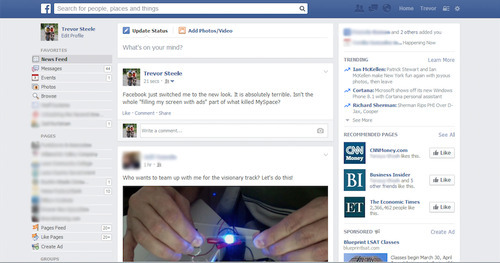 As is the trend with Facebook’s redesigns, people have already begun to scoff at the new look – myself and Trevorincluded. As users ourselves, we can’t help but feel miffed at the fact that sponsored ads now swallow almost one third of the page, and their feed alone is more than half the size of the new and improved News Feed. You might imagine that advertisers and agencies everywhere are doing the happy dance, ecstatic over Facebook’s generous donation of more space and greater visibility. You probably think we’re rejoicing over this belated Christmas gift, but in truth, we’re not. At least, we – the social media strategists – are most definitely not. Why? Because social media isn’t about bombarding your target audience with advertisements. It’s about being social; it’s about building a community and establishing relationships with them. And, as users ourselves, we know that people don’t want to be sold to – or at least, they don’t want to know we’re selling to them. Thanks to Facebook’s new look, it’s now more apparent than ever that ads are infiltrating the user experience. There’s no denying it, and there’s certainly no ignoring it. Every design that Facebook has debuted has been met with widespread criticism from disgruntled users, so I know we aren’t alone in this sentiment. It’s going to be especially interesting to see how people respond to the prominent strip of ever-changing ads on their News Feed. And, as Trevor points out, didn’t a similar stunt contribute to the demise of MySpace? If we, as social media strategists and advertisers, take Facebook’s bait and smother users with right column ads, we won’t just lose sight of the big picture – we’ll lose our target audience, too. That’s why our job now, more than ever, is to focus on striking a safe, subtle, and effective balance between News Feed ads, Sponsored Stories, and Right Column ads. The last thing we want is to drive our target audience away by turning the brands we manage into unwanted noise that saturates the social experience with an overbearing presence and mysteriously personalized ads. P.S. – want to follow us on Twitter? You can follow the Funk/Levis team here, and you can follow Trevor and me on our personal accounts.